After checking into the Hotel Park Hvar, Meg and I chose to use the last couple of hours of daylight to climb up to a fortress looking over the city and have a look around. The fort gave nice views of the city, housed a small museum of relics from shipwrecks in the area and had a fairly neat ‘jail’ that we were able to check out. After our trip to the fort we met up with the rest of the group and made our way to the home of a local family for dinner. 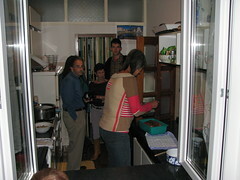 We were treated to a brief cooking lesson and a wonderfully delicious dinner of octopus salad and seafood risotto. After dinner we joined a few others for a drink after a lovely walk home along the sea. Tuesday saw us start our ride with a 10km uphill into a headwind. Not an easy ride at all, but very fulfilling to arrive at the top. Our ride up and down the other side took us through lavender fields and while they had been harvested previously, the scent was still in the air. The downhill to Stari Grad was as long in distance as the climb had been and was quite enjoyable, though like all the downhills we did it at a relatively controlled pace what with having no prior knowledge of the route and lots of corners strewn with gravel. We arrived in Stari Grad significantly before most of the others so had a chance to walk around before finding some pizza for lunch. After lunch we were back on the road cycling towards and through Jelsa. Riding around the bay there we then started back up another decently long climb that took us roughly 35-40 minutes. At the top we turned down a road that led us down to Vela Stiniva, a super cool valley that led down to a small cove on the shoreline. The road was quite narrow and had a number of tight switchbacks (180 deg hairpins) so provided for an interesting ride. At the bottom we stopped at a café/bar that opened just for us that day. Meg and I each had a beer while we waited for the rest of the group. When everyone else arrived we skipped some stones before getting back on the bus to Hvar town. Meg and I foraged for our own dinner at a restaurant in town before heading to bed. 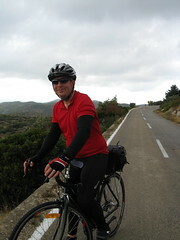 Wednesday was the last cycling day of our tour and saw us bus over to Stari Grad where we would start our ride. 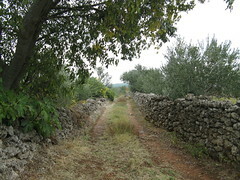 We rode from there through some rolling terrain that included a brief stretch through some Greek fields that dated back to the 4th century BC. We stopped in Vrboska, known as the ‘Little Venice’ based upon its natural canal with a couple of beautiful bridges. I wouldn’t go to Vrboska just to see them, but it was interesting none the less. 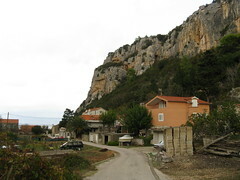 We waited for the group to arrive so that we could leave together and continue on to Jelsa where we were greeted with a picnic lunch. Milan had pulled together a great meal of local Croatian foods including sheep cheese, prosciutto, salads, breads and ajvar. Ajvar is a tasty spread made of peppers, eggplant, garlic and chilli peppers. We had wanted to bring some back with us, but never got around to buying any. After lunch we set out to ride through a number of villages that, along with Jelsa, take part in an Easter procession called Za Križen. This procession starts at 10pm and the participants start from each of their six villages. A cross bearer leads each group as they rotate between villages where they sit through a mass in the participating church before moving on to the next village in the rotation until they finish around 7am the next day. The procession has actually been given UNESCO Intangible Cultural Heritage status. We had ridden through Jelsa and Vrboska earlier in the day and made our way through Vrbanj, Pitve, Vrisnik and Svirče on the way back. Arriving back in Stari Grad, Meg and I chose to finish the cycling tour with the long option that saw us riding back up over the hill we had climbed and descended the previous day. It was a pretty good climb that involved 400m elevation in about 7-8km. Only five of the sixteen of us did this last climb, but there was no way Meg and I weren’t going to do it. The downhill side was as windy as the day before and so led us to be more cautious on the way down. 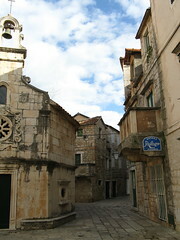 Arriving back in Hvar we did a bit of wandering around town including some shopping. We tried to check out a museum dedicated to the fine Agave lace that the nuns of Hvar produce, but sadly it was closed when we tried to visit. Our group enjoyed a farewell dinner as the majority of participants were headed home the next day (we were staying on another few nights for the post-trip extension). After dinner we went for some drinks and dancing with the guides, four ladies from Syracuse and another couple. After that it was off to bed so we could be up for our two hour ferry trip back to Split the next morning.